. . . and thank you for stopping in. This is the home for information about the works of Amy Metz. 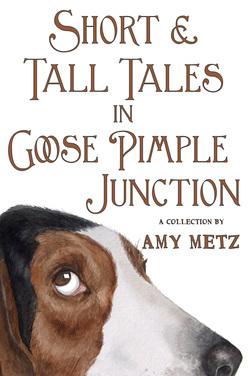 Amy is the author of the Goose Pimple Junction mystery series. She spends a lot of time in Goose Pimple Junction with her imaginary friends and on her blog, A Blue Million Books, but occasionally she ventures out to try something new. Check below and the More page in the menu above for interviews, reviews, and guest posts Amy has done and the News page for the latest with Amy and her Goose Pimple Junction mysteries. 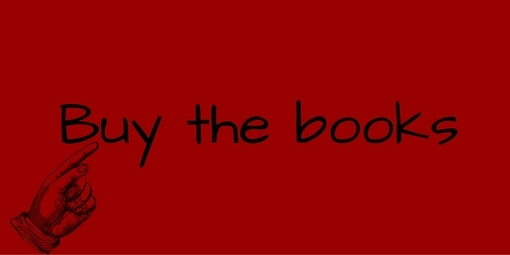 For a quick rundown of books published and projects Amy is currently working on, keep reading . . . 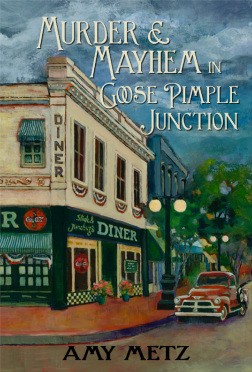 Murder And Mayhem In Goose Pimple Junction is the first book in a series of humorous southern mysteries set in the fictional town of Goose Pimple Junction. For more information on this book and to read the first chapter, please turn the page or click here. Buy here. Heroes And Hooligans In Goose Pimple Junction is the second book in the mystery series. Goose Pimple Junction is just recovering from a kidnapping and a murder, its first major crimes in years, when trouble begins anew. Life is turned upside down in the quirky little southern town with the arrival of several hooligans: a philandering husband intent on getting his wife back, another murderer loose in town, a stalker intent on frightening Martha Maye, and a thief who’s stealing the town blind of their pumpkins, pies, and peace. Together, they’re scaring the living daylights out of the residents and keeping the new police chief busier than a set of jumper cables at a redneck picnic. Suddenly he has his hands full trying to apprehend a killer, stop a stalker, and fight his feelings for the damsel in distress. Buy here. Short & Tall Tales in Goose Pimple Junction is the third book in the series, although it occurs chronologically between books 1 and 2. This is not your average Southern town. With a hint of mystery and a lot of laughs, you'll catch a glimpse of everyday life in Goose Pimple Junction in this short story compilation. Short & Tall Tales is a fun escape that will answer readers' burning questions about the residents of this quirky, small town. These questions and more are answered in Short & Tall Tales in Goose Pimple Junction. Five short stories, one novella, and three recipes will give you more of the unique charm of Goose Pimple Junction, make you laugh, and have your mouth watering. If you want a feel-good read, you've come to the right place. 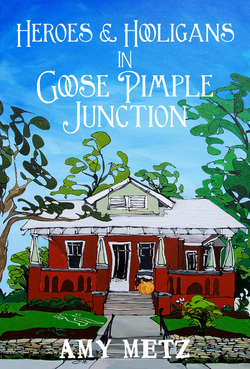 Grab some sweet tea and escape to Goose Pimple Junction. Buy here. Rogues & Rascals in Goose Pimple Junction is the fourth book and the third full-length novel in the series. Liars & Lunatics in Goose Pimple Junction, book 5 in the series, is in the works! After Caledonia Culpepper finds out an ex-beau has been murdered, being the honest person she is, there's only one thing to do. But Johnny knows the deceased is a no good lying cur dog, and he suspects someone else is guilty of murder. Now his job is to find out who is the biggest liar in town. Wynona is back in town, and she's opening a cupcake store. Virgil Pepper is running against Mayor-for-life Buck Lyons. And Hank Beanblossom tries to figure out why Wynona–now known as Daisy–looks so familiar. Want to subscribe to email notifications? Looking for great cozy mysteries? Visit CozyFan Novel Search at cozyfan.com.